Dr. Hal Wissel is well known for his ability to develop players. Hal founded Basketball World, an featuring basketball camps, clinics, books, and DVDs. Coach Wissel’s highly successful SHOOT IT BETTER Mini Camps are conducted worldwide for players ranging from NBA to youth level. Also visit CoachWissel.com. Basketball: Steps to Success has been translated into three languages. Becoming a Basketball Player has been made into five DVDs. Coach Wissel has a wealth of NBA experience as an Assistant Coach with the Atlanta Hawks, Memphis Grizzlies and New Jersey Nets. Hal was also Director of Player Personnel with the Nets and Advance Scout with the Milwaukee Bucks and Dallas Mavericks. As a head college coach, Wissel compiled over 300 victories. Hal coached Florida Southern College to the 1981 Division II NCAA Championship. Get Coach Wissel's FIVE excellent shooting DVD's. Believe in yourself. You want to have confidence in your ability to make the shot every time you shoot. Confident shooters control their thoughts, feelings, and shooting skill. Shooting is much more than good mechanics. It's the feeling, thoughts and belief in your self that comes first. Basketball is a mental, as well as a physical, game. Developing the mental aspect is a key to enhancing shooting as well as performance in all fundamentals. To help your confidence it is important to know that the basket is big. The basket is so big that three and one half balls can fit in the rim. This surprises most players. You can get on a ladder and fit three balls side by side over the rim and have enough space to fit and turn your hand between each ball. Realizing that the basket is so big should give a psychological boost to your confidence. To also help your confidence, keep your follow through straight up until the ball reaches the rim. This is not only mechanically correct, but more importantly you will look and act like a shooter. Feel positive that each time you shoot the ball will go in. Good shooters stay confident even when they hit a cold streak and miss a few shots. After a missed shot, mentally correct the miss and visualize a good shot. Positive affirmation statements ("I'm a shooter!" All net! or "Count it!" for example) that you can say to yourself can promote confident thoughts about yourself and your ability to shoot. You can also remind yourself of past successes to boost your confidence. Being able to shoot under pressure distinguishes great shooters from the good shooters. You want to take the shot not only when your team is ahead, but when the pressure is on. The direct correlation between shooting confidence and shooting success is the most consistent factor we recognize in great shooters. Skills should be smooth, free flowing, and rhythmical and this is especially true in shooting. Mechanics are important, but you want to have good mechanics without being mechanical. Your shot should be smooth and rhythmical rather than mechanical. All parts of your shot should flow together in a sequential rhythm. To help our rhythm and range we use a down-and-up action of our legs, rather than lowering the ball or stepping into the shot. Start with your knees slightly flexed: Bend your knees and then fully extend them in a down-and-up motion. Saying the key words Down and up! from the start of your shot until the release of the ball will trigger the down and up action of your legs that provides rhythm and force for your shot. Your legs and shooting arm move together. As your legs go up your arm goes up. As your legs reach full extension, your back, shoulders and shooting arm extend in a smooth, continuous forward and upward direction toward your target. It is important to keep the ball high with your shooting hand facing the rim. Use the down-and-up motion of your legs for rhythm rather than lowering the ball for rhythm. Keeping the ball high fosters a quick release and also provides less chance for error. Stepping into your shot may help your range, but your shot becomes a two-count shot. Using the down-and-up method allows you to shoot in one motion or one count. When shooting off the catch the down comes just before the catch and the shot goes up as your legs go up providing for a quicker release. Basic mechanics of shooting include sight, balance, hand position, elbow-in alignment, shooting rhythm, and follow-through. To develop your shot it is best to concentrate on only one or two mechanics at a time. As important as confidence is, accurate shooting takes more than positive thinking: it also takes shooting skill. Neither mental confidence nor mechanics alone is enough. Success results from the integration of the mental and mechanical aspects of shooting. When you think, you are in a sense talking to yourself. That talk can be either positive or negative. A technique called positive self-talk can help you integrate the mental and mechanical aspects of shooting, speeding the improvement of your shot. Positive self-talk uses key words (also called cue words) to enhance performance. Select words that help you learn correct mechanics, establish rhythm, and build confidence. The key words should be positive, concise (preferably one syllable), and personalized. A positive word that you associate with a successful shot is called an anchor word. Identify an anchor word to positively reinforce the visualization of a successful shot. Select your own personal anchor word that allows you to visualize your shot going in. Examples of anchor words are: Through! In! Yes! Net! Swish! Whoosh! Face! High! - to start your shot high and prevent lowering the ball. Straight! - to make your shooting hand go straight to the basket and stop turning your wrist. Front! - to key the position of your shooting hand facing the rim. Point! - to key the correct release of the ball off your index finger. Up! - to key a high arch. Through! - to key any part of your follow-through including shoulders, arm, wrist, and finger. Head in! - to key the follow-through of head and shoulders toward the basket and prevent leaning back or stepping back. Legs! - to key the use of your legs. Down and up! - to key the down and up action of your legs for rhythm and range. Identify a personal trigger word or words that you associate with the correct mechanic or mechanics for you. Practice using different trigger and anchor words until you find what works for you. Select two words that trigger the correct mechanics and one anchor word to reinforce shooting success. Sometimes you may want to say the same trigger word two times in order to produce the desired result. For example, saying Straight! Straight! may prove more effective than saying Straight! only one time to key your shooting hand to start straight and finish straight. One word can also be both a trigger and an anchor word. For example, the trigger word Through! can key the follow-through of your shoulders, arm, wrist, and fingers and it also can be an anchor word for the ball going through the basket. Say your three one-syllable words in rhythm, from the time your shooting motion starts with your legs until you release the ball off your index finger. For example, if legs and through are your trigger words and yes is your anchor word, you would say in rhythm to your shot: Legs-through-yes! It works better to say your words aloud, rather than to yourself. Saying your personalized key words in an even rhythm establishes the rhythm of your shot and enhances your mechanics and confidence. Give time to mental, as well as physical, practice. Mentally practice by relaxing and saying your key words in the rhythm of your shot as you visualize shooting and seeing the ball go in the basket. Guard against "paralysis by analysis". This happens when you think about too much. A sure sign of too much thinking is when your shooting rhythm becomes slow or uneven. Saying only three or less one-syllable key words tends to keep you from doing too much thinking. The words are actual thoughts. Your goal is to reduce conscious thought and promote automatic execution of your shot. Trigger words help make the mechanics of your shot automatic, and an anchor word, which reinforces a successful shot, helps build your confidence. As shooting improves one trigger word may suffice. Eventually, an anchor word may be all you need to trigger the automatic action of your shot. Learn to shoot correctly and then practice intelligently each day. Develop an understanding of your own shot. You can always benefit from having an instructor or coach watch you shoot. Most of your practice, however, occurs when a coach is not present. Personal feedback (information about your performance) can help you determine what adjustments to make. Three basic sources of performance feedback are observing the reaction of your shot on the rim, internally feeling your shot, and video analysis of your shooting form. Analyzing a shot's reaction on the rim can reinforce successful execution or reveal most shooting errors and their possible causes. For example, the ball goes where your shooting arm, hand, and shooting finger direct it. If you missed to the right (or left), your shooting arm, hand, and finger was pointed in that direction. Perhaps your body faced in the direction of the miss, rather than being square to the basket, or your elbow was out, causing your follow-through to go to the right. If you see that the ball hits rim and circles out, you know you shot the ball with sidespin, which is generally caused by your shooting hand starting on the side of the ball and then rotating behind it. If you over rotate your shooting hand, the ball will hit the right rim with sidespin and roll left. If you under rotate, the ball will hit the left side of the rim and roll right. Other causes of sidespin are having your palm on the ball, the ball sliding off your ring finger rather than your shooting finger, moving your hand on the ball, or thumbing the ball with your non-shooting hand. Your sense of feel also yields clues: You might feel your shooting hand rotate to the right or the ball come off your ring finger (instead of your shooting finger). Both mistakes will give the ball sidespin. An excellent method to develop feel is to shoot with your eyes closed. Have a partner rebound and tell you whether the shot was successful. After a miss your partner tells you the specific direction of the miss and the reaction of the ball on the rim. By analyzing your shot, you can detect and correct errors before they become bad habits. Act like a shooter, feel like a shooter, be a shooter. Many players commonly get upset at an error, particularly a missed shot, and often dwell negatively on the missed shot thus negatively affecting succeeding shots. Each time a player verbally recites a negative word, acts with negative body language, or has negative thoughts after a missed shot the brain is being conditioned to perform the same missed shot again. Learn to "act like a shooter," rather than dwelling on your missed shot. We use the computer analogy. When you use a computer and make a mistake, what do you do? Do you type the same mistake again? No! You erase and correct it. You back space to delete it, or you cut and paste the correction. The same should apply to a shooting error. After a miss, know why you missed by seeing the reaction of the ball on the rim or by the feel of your shot. Immediately correct the miss with a positive trigger word that corrects the miss. For example, if your shot was short and you felt it was due to not using your legs, immediately correct it with a positive trigger word such as Legs! - to key the use of your legs. After a missed shot mentally correct the miss with a positive trigger word and then visualize a good shot. An excellent method that can be used to condition successful shooting is to use a positive anchor word in association with correct mental rehearsal and visualization of a successful shot. Select your own personal anchor word that allows you to visualize your shot going in, such as Through! In! Yes! Net! Swish! Whoosh! Face! As soon as possible after missing a shot, correct the miss with a positive trigger word, and then visualize a good shot while saying your anchor word. The purpose of this method is to avoid negative thoughts, which can disrupt concentration and lead to other missed shots. Learning to react to a missed shot by visualizing a successful shot and saying your anchor word will condition you to "Act like a shooter, feel like a shooter and be a shooter." The most common errors in shooting are listed below, along with suggestions on how to correct them. Error. Your shot is short. Correction: A shot that is short is usually due to not using your legs, an incomplete follow-through, or a slow or uneven rhythm. Through feel you should be able to determine whether you need to emphasize force from your legs, complete follow-through by keeping your arm up until the ball reaches the basket, or an even paced rhythm. Error: Your shot is long. Correction: Your shooting arm is extending on too flat a trajectory (less than 45 degrees). Raise your shooting arm higher when you shoot putting a higher arc on your shot (45 to 60 degrees). You are leaning your shoulders back as the shoot. Shoot with your head and shoulders going forward and upward toward the rim as you follow-through. Your hands are positioned too far apart from each other on the ball preventing you from lifting the ball. Move your hands closer together. Error: Your shot is inconsistently short or long. Correction: You probably have incomplete and inconsistent elbow extension on your shots. Extend your arm with complete elbow extension on follow-through. Error: Your shot hits the right side of the rim (right-handed shot). Correction: You are either not squared up facing the basket, or you are starting your shot with the ball set in front of your head and your elbow out causing your arm to extend to the right on the shot. Start with your body square to the basket. Set the ball on the shooting side of your head between your ear and shoulder with your shooting hand facing the front of the rim. This will enable you to shoot with your arm wrist and fingers going straight toward the basket. Error: Your shot hits the left side of the rim (right-handed shot). Correction: You are either not squared up facing the basket, or you are starting your shot with the ball set on your right hip or too far to your right resulting in shoving the ball from right to left as you shoot. Shoving the ball is a fault that results from not using your legs for power. Start with your body square to the basket. Set the ball on the shooting side of your head between your ear and shoulder with your shooting hand facing front and your elbow in. Shoot with your shooting arm, wrist and finger go straight toward to the basket. Error: Your shot lacks range, control and consistency. You miss short, long or to either side. Correction: You are probably lowering the ball and/or bringing the ball behind your head or shoulder and throwing the ball to the ball to the basket with an inconsistent follow-through. Lowering the ball or throwing the ball is a fault that results from not using the down and up action of your legs for power. Set the ball high on the shooting side of your head between your ear and shoulder with your shooting hand facing front. Emphasize the down and up motion of your legs and complete follow-through until the ball reaches the basket. Starting your shot high will give you a quicker release, less chance for error and less chance for your shot to be blocked. Error: Your shot hits the side of the rim and circles out (right-handed shot). Correction: You shot the ball with sidespin. The most common cause of sidespin is starting your shot with your shooting hand on the side of the ball and then rotating your hand behind it. If you over rotate your shooting hand, the ball will hit the right side of the rim with sidespin and roll left. If you under rotate, the ball will hit the left side of the rim and roll right. Other causes of sidespin are the ball on the palm, the ball sliding off your ring finger rather than shooting off your index finger, moving your hand on the ball, or thumbing the ball with your non-shooting hand. To prevent rotating your hand, the ball sliding off your ring finger or moving your hand, set your shooting hand behind the ball so it faces the front of the basket and shoot with your hand and index finger pointing straight toward the basket. To prevent thumbing the ball with the thumb of your non-shooting hand, place the ring finger and pinky of your non-shooting hand under the ball. Squeeze the thumb and index finger of the non-shooting hand together to help you to shoot the ball only with your shooting hand. Set your shooting hand behind the ball and facing the basket and shoot with your hand and index finger pointing straight toward the basket. At first your shot may have a tendency to go to the left due to not getting the extra force from your non-shooting hand. You will learn to adjust by using more power from your legs and shooting hand. Error: When shooting off the dribble, you miss to the right or left side of the basket. Correction: You are probably reaching to the side for the ball and starting the shot from the side of your body. When open dribble to the front of your shooting knee, jump behind the ball and pick up the ball with your shooting hand on top of the ball so when you bring the ball up your shooting hand will be facing the front of your target. Error: When shooting off the dribble, you float forward, back, or to the side. Correction: When open dribble to the front of your shooting knee. Pick up the ball in front of your shooting knee (shooting hand on top of the ball) with your knees flexed to gain balance for your shot and prevent floating. Familiarize yourself with the player you are coaching. Learn to listen more than you talk. A player wants to feel comfortable with you and have confidence in you before they work with you. At times you will coach a player that will feel that you think he cannot shoot. Always start with what the player is doing well. Coach each player individually. You do not want a player to learn everything that you know about shooting. You want each player to learn what he wants to know in terms of improving his shot. However, you should be able to answer every question the player will ask. Encourage the player to talk to you and say what he likes and doesn't like. Tell the player, "I want to get you to shoot with confidence and rhythm. I want to work on that mechanic that helps your shot the most. The point is, it's your shot and you adjust what you want to adjust. I'm here to coach you and help you, but you're going to learn to coach yourself." Find out what a player is looking for by asking questions. You can learn a lot about a player from his answers. When you really listen to the answers, you can gear your responses to suit the player's particular needs. Ask the player, "When you are shooting well, what are you doing? There is no wrong answer to this question. It simply gives an indication of a player's confidence level and what he knows about his own shot. If a player responds with the answer, "I just shoot!" It may indicate that he has confidence, or that he is not over thinking when he shoots. When a player answers, "When I'm shooting well, my shoulders are going toward the basket." Then you have an idea that he has an understanding of what he wants to do when shooting. When a player answers, "The ball is going in!" It probably means that he does not know much about his shot. Keep it simple. Keep your instruction brief, simple, yet inspiring. Players lose interest if your coaching is long, too detailed, or boring. For the most part, a player is not progressing while you are talking. Get the player shooting. Strive to keep a player's confidence level high. Be positive and keep encouraging the player to know that he can and will achieve his goals. Motivate the player to consistently do what it takes to reach his goals and never let him think for one moment that he will have anything less than success. Constantly tell the player, "You're a shooter!" When a player does not want your help do not take it as a personal attack on you. In fact, only one player or a few players may be interested in receiving your coaching. Once you have success with one or more players, others will become interested in how you can help them. Never stop coaching, When a player sees that you care about him, are positive, enthusiastic, energized and tenacious, it will inspire him to reach new heights. Above all, make it enjoyable! You become a better coach to a player when he sees that you have high spirits, a bright smile and a sense of humor. From: Wissel, Hal. (2005). Basketball Shooting: Confidence, Rhythm and Mechanics. 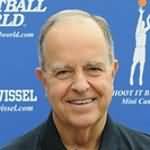 Basketball World, Suffield, CT.
Coach Wissel has FIVE excellent shooting DVD's available... click here for details. Take your shooting and game to the next level... with FIVE excellent shooting DVD's by Hal Wissel.